All my life I have studied what is underneath. The process of uncovering layers—places that are vibrant, dark, passionate, mysterious, hidden, and utterly luminous—excites me. Throughout my life what has interested me most is seeing the psychological complexity in everyone around me. I have focused my thirty-five year psychotherapy practice on excavating truth—understanding and helping others to see what is not immediately visible. As an artist, I work spontaneously on a vigorous but unplanned search for answers, where each layer of color and mark, each moment, each brush stroke informs the next. 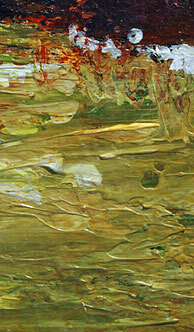 Though as a woman and a psychotherapist I rely on language, I paint from a place without words. Here I speak through my love of color, through the textures of thick, sensuous paint, and with the light that emerges through transparent glazes. My palette is informed by what I see, internally and externally—the colors of water, light, shadow, rock, erosion, pain, passion, fullness. Using many layers of acrylic paint, I strive to build up a sense of breath and expansion, wanting my viewers to be drawn into their own emotional layers and interstices. In layering paint and color into palpable textured areas on the canvas—sometimes thick, sometimes thin—I access deeper and more complex levels in myself and in my work. Always present for me is a vigorous pursuit of the balance between intensity and stillness. This is reflected in the juxtaposition between vibrant form and expanded space that is ever present in my paintings.